The Asian Library is dedicated to enhancing student learning, accelerating research, and engaging with the communities. 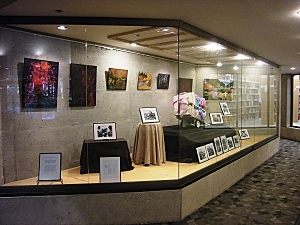 Exhibitions serve to promote UBC Library’s collections, programs and services, as well as to inform and educate the audiences about Asian art and culture. The Asian Library welcomes exhibit proposals from individuals, groups, and organizations within UBC and from the broader community. There are two exhibit spaces. Both are in the Asian Centre foyer. The two spaces are varied in size and can be used for different types of small scale exhibits. Please contact us for the specifications. Anyone who is interested may submit an application to use any of the Asian Library exhibit space(s). Normally, exhibits will be for one month to three months in duration. Priority will be given to programming that compliments the strategic directions of UBC and the service mandate of Asian Library. The exhibit hours will be the same as the Asian Library open hours. Approved exhibits will be booked at the discretion of the Asian Library based on availability and suitability for the space. Prospective exhibitors must read and adhere to the exhibit goals and criteria as listed on this page. Prospective exhibitors must submit the Art and Cultural Exhibit Booking Request form with a minimum of three months of advance notice to asian.library@ubc.ca. The Asian Library will approve or reject the proposal in a timely manner and contact the prospective exhibitor with the result. If approved, the exhibitor must sign a completed Exhibitor Agreement and return it to the Program Services Assistant. Exhibitors agree to release the Asian Library and its officers, employees, agents, and elected officials from and against any and all claims, actions, damage, loss or injury, howsoever or whenever occurring, to works and other property any person at the Asian Centre as a result of or in any way connected to the display of the said works. Exhibitors must coordinate times for set-up and take-down of exhibit items with Asian Library staff. Storage for items owned by the exhibitor cannot be provided. Please note that the Asian Library does not participate in commercial sales. No prices will be displayed with items. With permission we will make the exhibitor’s name and contact information available to the public. It is the responsibility of the person who signs the agreement for space use to serve as the authorized representative of the group and to remain as the lead contact on the premise throughout the period for which it is reserved. In order to maintain the Asian Library’s exhibit spaces, the above terms and conditions apply. have other penalties applied as determined by the Asian Library. 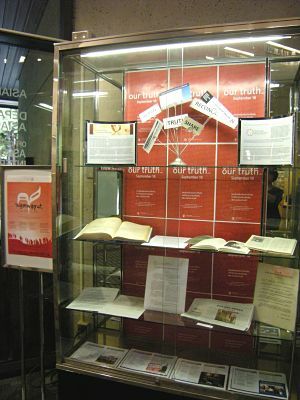 The Asian Library does not accept liability for damages, losses, or theft to the materials exhibited. The exhibit spaces must be left in satisfactory condition. Exhibitors using the exhibit spaces must assume liability for damages to the Asian Library property resulting from said usage, as assessed by the Asian Library.